The programme is expected to last several decades and global sales are projected to be 3,000. The US government's accountability office estimates all costs associated with the project will amount to one trillion dollars. "If suspect fuel tubes are installed, the part will be removed and replaced. If known good fuel tubes are already installed, then those aircraft will be returned to flight status. "Inspections are expected to be completed within the next 24 to 48 hours." 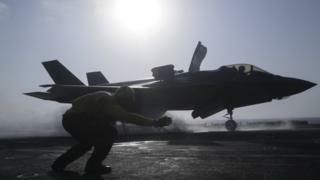 The Ministry of Defence in London said the UK had decided to "pause some F-35 flying as a precautionary measure while we consider the findings of an ongoing enquiry". 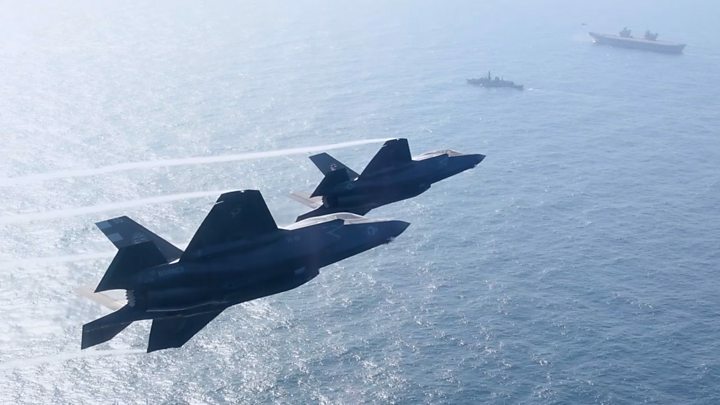 But the MOD said F-35 flight trials from the aircraft carrier, HMS Queen Elizabeth, were continuing and the programme remained on schedule to provide UK armed forces with "a game-changing capability". It will equip the US Air Force and Marine Corps as well as several of Washington's allies. It represents a step-change in capability but the F-35's complexity has inevitably thrown up problems.